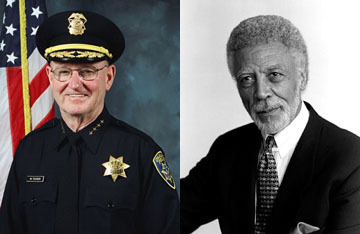 Oakland Police Chief Wayne Tucker and Oakland Mayor Ron Dellums. OAKLAND — Mayor Ron Dellums on Tuesday called for an expansion of the state investigation into the Police Department’s handling of journalist Chauncey Bailey’s slaying to include the delay in the raid of Your Black Muslim Bakery. Dellums’ comments came in reaction to reports Tuesday by The Chauncey Bailey Project that the raid was delayed 48 hours to accommodate the vacation schedules of two SWAT commanders. Police postponed the raid from the planned date of Aug. 1, 2007, to Aug. 3, 2007, because two senior SWAT commanders were on a backpacking trip, the Bailey Project, a consortium of Bay Area journalists, reported. That decision came over the objection of the homicide detectives who suspected bakery members in two July 2007 gun slayings and feared a killing spree had begun. The detectives wanted immediate action to prevent additional bloodshed, although they had no indication Bailey had been targeted. If not for the delay, Bailey might be alive. A masked gunman killed him Aug. 2, 2007 — between the date the raid was first scheduled and the date when it was carried out. Police did not know he had been targeted. A bakery dishwasher, Devaughndre Broussard, confessed to the slaying, and then recanted. He’s scheduled for trial next year. Police Chief Wayne Tucker, in an interview Monday, denied the raid was delayed, then said he made the decision to delay it. Tucker declined a request Tuesday to clarify his comments. Police have for 15 months denied the raid was delayed. Dellums said a state Justice Department investigation he requested in October to parallel the department’s own probe should include looking at the timing of the raid and what Tucker and other police commanders have said about it. “Everything should be on the table,” he said when asked about Tucker’s contradictory statements. Dellums requested the state investigation after the Bailey Project reported that the lead detective in the case, Sgt. Derwin Longmire, failed to document in his case notes evidence that pointed to a conspiracy to kill Bailey involving bakery leader Yusuf Bey IV. The Alameda County District Attorney’s Office is now investigating Bailey’s killing independently of Oakland police. Longmire is to be transferred to the patrol division early next year, as is his supervisor, Lt. Ersie Joyner III. Police commanders have called those moves routine and unrelated to the Bailey case. Joyner and Deputy Chief Jeffrey Loman are also being investigated for their supervision of Longmire’s work. City Council President Ignacio De La Fuente, who joined Dellums in calling for the state investigation, also said Tuesday the public has a right to know everything that happened in the case. Councilmember Jane Brunner, whose district includes the former bakery, said the department “has no reason not to be transparent” about the raid’s delay. Thomas Peele is an investigative reporter for the Bay Area News Group. Bob Butler is an independent journalist. Reach them at tpeele@bayareanewsgroup.com and bobbutler7@comcast.net.